Check Out My Web Design Info. What is this site about? 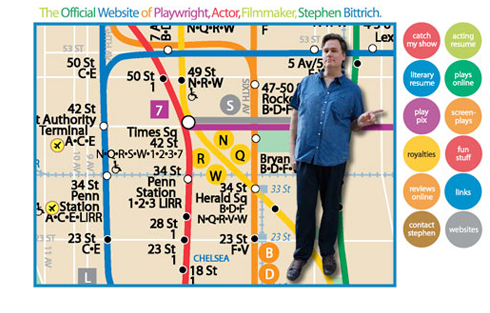 This is the Official Website of New York City based Actor, Writer, Director, Filmmaker, Website Designer Stephen Bittrich. Looking to find out more about my new webseries, Off Off? I wrote and created the new online "dram-edy" Off Off about 4 guys in their 40s running at Off Off Broadway Theatre in New York City. Off Off is a webseries for people who NEVER give up on their dreams! Looking to perform the best Ten Minute Plays, Skits, Comic or Dramatic One-Acts and Full-Length Plays (including 10 Minute Plays for High Schools and Colleges and/or Universities)? You've come to the right site. Looking to option Short Screenplays (Short Scripts) Full-Length Screenplays. I have many properties for film. The latest featured plays are THE ACQUISITION, a Period Play set in Regency England along the lines of Jane Austen, EVEN, a modern dark family drama set in a motel in the Arizona Desert. It's a very cinematic play and could make a fine low budget film as well. HOLE (contact me for script), a four person play (a drama) set in a mine cave-in in West Virginia. HOME OF THE GREAT PECAN, a wacky Southern comedy (a farce) set in Seguin, Texas meant to be acted by four accomplished actors playing 21 parts, or... you can cast as many as 21 actors. It's somewhat like Greater Tuna meets Plan 9 from Outer Space. PECAN also has its own site with production shots. The latest featured screenplays are TASTY MORSELS, a low budget horror screenplay for sale or option perfect for an independent filmmaking project. HEALER, is a full-length screenplay which has been optioned by Past Present Productions. Stephens' Quick Pick. Wanna cut right to the chase? Get in Stephen's head right away? Stephen recommends La Mouche. It's quick (10-Minute Play), fun, and painless. Want another of a different flavor? Try the beginning of Stephen's new full-length play, The Acquisition set in Regency England (the time of Jane Austen). Glad to send you the full length version if you send me an email. 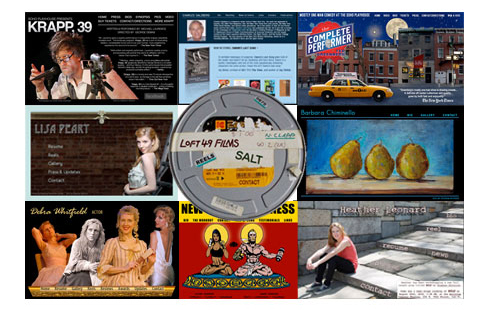 Website Design: I can create an artist / actor website for you (I offer an artist discount), and I specialize in creating websites for Fine Artists, Actors, Writers, Playwrights, Directors, Theatre (Theater) Companies, New Plays, New Play Productions, and Filmmakers. I've also done a few Not-for-Profit sites as well as websites for accountants, marketing firms, doctors, psychologists, psychiatrists, and lawyers. Go here to check out my website portfolio.